This recipe was inspired by Dr. Mark Hyman’s new book, Eat Fat, Get Thin. His new #1 best seller contains ground breaking information that will change everything you’ve been taught about fat-(especially if you were raised in the late 60’s and 70’s). Those suffering with heart disease, diabetes, difficulty losing weight, and inflammation should get this book! Included in Hyman’s book is a recipe section full of healthy, quick, and amazing dishes that will get you excited! These recipes alone are worth the price of the book! This is amazingly easy to make and will impress! It looks and tastes like you spent way more time preparing than the quick 20 minutes required. The first step, is choosing the right fish. Living in California, I’m often privy to fresh black cod (sablefish) which is a cross between a sea bass and halibut in texture and flavor. It’s wonderfully delicate, soft, buttery and won’t wreak havoc on your budget. If black cod is not available, I usually turn to frozen wild caught Alaskan cod, also very inexpensive. Halibut will work too but is a much drier fish. Turn oven to 375 degrees. Pulse nuts in a food processor until fairly fine and crumbly-do not over process or you’ll get nut butter (or chop by hand). Add the salt and coconut flakes and pulse a bit more. Pour this mixture onto a plate. Rinse fish and pat dry. Spread mayonnaise on both sides of the fish. Pat the nut and coconut mixture onto both sides of the fish. Place the fish on a shallow baking dish lined with foil or parchment paper (I prefer this). Drizzle with warm liquid coconut oil. If you’d like to try for a crispier texture on the underside of the fish, try placing the parchment paper directly on the oven rack. If you use this method, be careful when drizzling the coconut oil on top. Bake for about 20-25 minutes (depends on thickness of fish) until the middle is opaque, not translucent. Squeeze a bit of lime on top and serve. 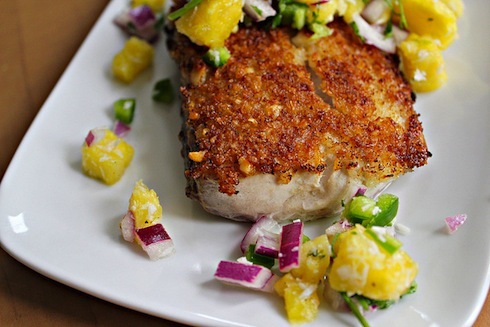 If you’d like a bit of extra flavor and color try adding the Mango Salsa below. Mix all this together and serve.